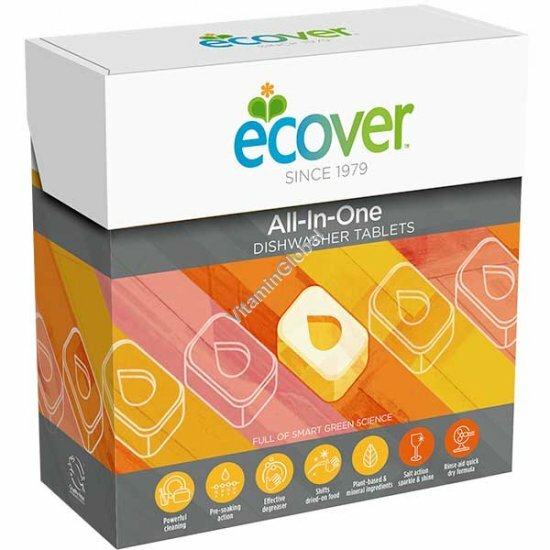 Ecover dishwasher tablets unleash the power of biodegradable plant-based ingredients to leave your dishes squeaky clean. They already contain rinse aid and salt action so you just have to pop the tablet in and run the machine. Ingredients: 5-15%: Oxygen-based bleaching agent. <5%: Non-ionic surfactants, Perfume (Limonene), Enzymes. Others : Sodium citrate, Sodium carbonate, Polypeptide, Disodium disilicate, Bleach activator, Sodium bicarbonate, Sorbitol, Bentonite, Glycerin, Sodium gluconate. Instructions for use: Remove large food scraps from your dishes. Remove the wrapper from the tablet. Place the tablet into the dispenser. If the tablet does not fit in the dispensers place in the cutlery basket. One tablet will clean a machine as per the manufacturer's instructions.